Boasting a special high-performance formula, Deborah Milano's Gel Effect Nail Enamels ensure an impeccable manicure that's incredibly easy to achieve. The enamel leaves nails looking lusciously plumped and spectacularly shiny. Formulated to impart ultra-pigmented colour, a super-glossy finish, and flawless coverage. The easy-to-apply consistency forms a supple film that helps nails withstand shock. The extra-large brush produces a brilliantly shiny surface without UV light. The result is flawless coverage and the smoothest gel-like finish. Special filters form a supple film that keeps colour as vibrant as the day it's applied and disguises any imperfections. About the Brand: Italy's leading make-up brand, Deborah Milano embodies Italian excellence since 1962. For over 50 years Deborah Milano has been making beauty an affordable and accessible pleasure for all women. Combining a flair for colour, latest trends and a focus on quality certified by the Deborah GroupA s own research laboratories, the brandA s eye catching designs, attention to detail and unmistakably Italian flavour have become its hallmarks. Explore the entire range of Nail Polish available on Nykaa. 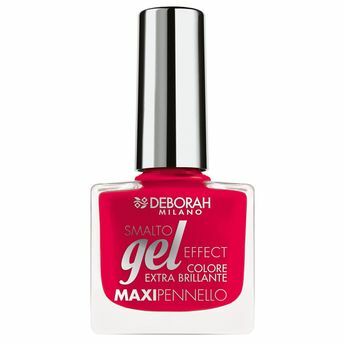 Shop more Deborah products here.You can browse through the complete world of Deborah Nail Polish .Alternatively, you can also find many more products from the Deborah Gel Effect Nail Enamel range.